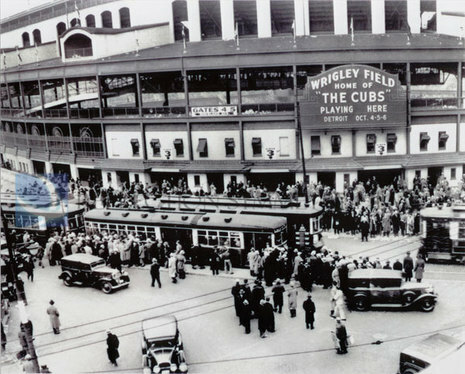 The 1935 World Series featured the Detroit Tigers and the Chicago Cubs, with the Tigers winning in six games for their first championship in five Series appearances. They had lost in 1907, 1908, 1909, and 1934. The Tigers won despite losing the services of first baseman Hank Greenberg. In Game 2, Greenberg collided with Cubs catcher Gabby Hartnett and broke his wrist, sidelining him for the rest of the Series. Marv Owen replaced him at first base and went 1 for 20. Utility infielder Flea Clifton was forced to fill in for Owen at third base and went 0-for-16 in the Series. The Cubs had won 21 consecutive games in September (still a record as of 2009), eventually taking the National League pennant by four games over the defending World Series champions, the St Louis Cardinals. In addition to Bridges, the Tigers had a hitting hero. Right fielder Pete Fox accumulated ten hits and an average of .385 for the Series. Fox hit safely in all six games. Detroit owner, Frank Navin, then 64 years old, had been running the organization for 30 years and had seen four of his teams win American League pennants, only to lose four World Series. Six weeks after the Tigers finally won the World Series in October 1935, Navin suffered a heart attack while riding a horse and died. The Detroit Tigers were still searching for that first elusive championship title as they stood atop the American League and returned for their second consecutive World Series against Charley Grimm's Chicago Cubs (who had won twenty-one consecutive games in September). Hank Greenberg and Charlie Gehringer set the pace for Detroit's line-up hitting thirty-six and nineteen home runs during the regular season and Greenberg topped the list with one-hundred seventy runs batted in. On the mound, Tommy Bridges went 21-10, Schoolboy Rowe won 19-of-32 and Elden Auker finished 18-7 in an average, but well-balanced effort that resulted in a 93-58 season. Chicago was not on par (at the plate) managing a team high of only twenty-one homers for Chuck Klein and ninety-one runs batted in from Gabby Hartnett. However, what the Cubs lacked in offense, they made up for with dangerous pitching as Bill Lee (20-6) and Lee Warneke (20-13) helped their team go 100-54 and edge out the defending National Leaguechampion St. Louis Cardinals who had been picked for a repeat. Game 1 pitted Cub's ace Lee Wanrneke against Schoolboy Rowe resulting in a 3-0 shut out, but the scales tipped considerably in Detroit's favor during Game 2 when Hank Greenberg broke his wrist (trying to score from first on a single). As a result, he was removed from the line-up for the remainder of the Series. With Greenberg on the sideline, Detroit switched third baseman Marv Owen to first and inserted Flea Clifton at Owen's position. Both went 1-for-36 in the Series and many felt that Greenberg's injury was the biggest deciding factor between victory and defeat as he had helped Detroit even the Series at a game apiece. Before the injury he had capped a four-run rally in the first with a two-run homer off of Charlie Root (who was in his first Series appearance since Ruth's "called shot"). The Tigers went on to win, 8-3, on Tom Bridges' six-hitter. 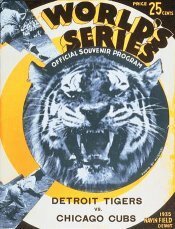 With the Series tied at a game apiece, both teams went head-to-head for an eleven-inning, Game 3 nail biter that ended on a Jo-Jo White run-scoring single for a 6-5 Tigers' triumph. Detroit made it three in a row the next day when Alvin Crowder out dueled Tex Carleton in a 2-1 effort that put his team ahead two games and one win away from their first World Championship. Chicago's last stand resulted in a crucial Game 5 win featuring six shutout innings by Warneke, who left the contest due to a sore shoulder. Bill Lee came in as relief and finished the job with a 3-1 victory that set the stage for a dramatic Game 6. The Cubs were still alive, but for how long? The answer came slowly the following day as the score remained tied 3-3 for 8½ excruciating innings. In the top of the ninth, Chicago's Stan Hack was perched on third base with no one out. With the potential Series-tying run standing ninety feet from home plate, pitcher Tom Bridges remained hopeful. Luckily, he wasn't facing the heart of Chicago's order. Instead, eighth-place hitter Billy Jurges, pitcher Larry French and leadoff man Augie Galan were due up. The Tigers' ace came up clutch as he struck out Jurges, induced French to ground out, and forced Galan to fly out all while holding Hack stranded on third. As Detroit took their turn, Mickey Cochrane knocked a single past Bill Herman and proceeded to advance to second on Charlie Gehringer's groundout. With two outs, the winning run was in position and things were looking good. Goose Goslin, who had delivered the twelfth-inning hit that won Game 2 of the '34 Series for Detroit, was up next. Goslin, in what would be his one-hundred twenty-ninth (and last) at-bat in World Series play, launched a single to the right field wall and Cochrane scored from second with the winning run. Pete Fox, who doubled home Detroit's first run in the finale, was the leading batter in the Series with a .385 average. Gehringer hit .375 for the Tigers (after hitting .379 in the previous year's fall classic). Bill Herman, who drove in all three of the Cubs' runs in Game 6, had a Series-high six runs batted in and tied Klein for Chicago's batting lead with a .333 mark. The Tigers' Bridges and the Cubs' Warneke each were 2-0. After their fourth attempt, Detroit had finally won their first World Championship title while their opponents (who hadn't won since 1908) are still waiting to this day.